Compression Socks are designed with the merge of Micro Circulation Compression technologies. The graduated compression is designed to promote improved blood circulation & reduce swelling, also great to soothe aches and pains. These Socks also offer Vein Therapy which helps relieve symptoms of spider and varicose veins. 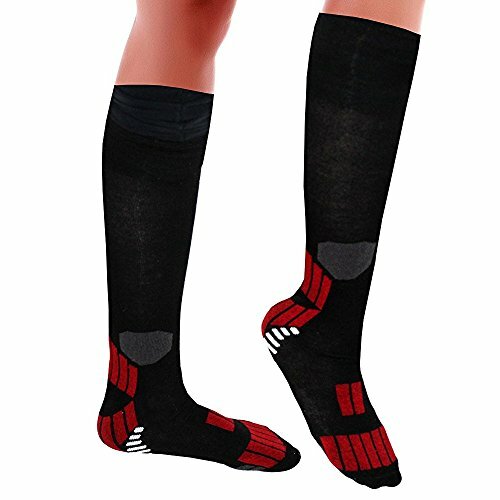 The Compression Socks are anti-microbial and are designed to naturally remove unpleasant foot odors with a great breathable, wickable fabric to get rid of the issue. Size may be slightly inaccurate. If for any reason any of our product do not meet your expectations, return it within 30 days after receiving it and we will give you your money back. If for any reason any of our product do not meet your expectations, return it within 60 days after receiving it and we will give you your money back. ? ✔ REDUCE FEET SWELLING: These anti-fatigue compression socks are the perfect way to address varicose veins, spider veins, or the uncomfortable swelling associated with spending all day on your feet. ✔ ENHANCES BLOOD CIRCULATION: Graduated compression helps enhance circulation and relieve leg stress and swelling that many active professionals experience. ✔ RELIEVES PAIN: Designed to increase blood circulation and prevent leg swelling, energizing your body throughout the day and reduce leg muscle fatigue during activities. Ideal for travel and daily wear. Relieves symptoms of varicose veins As thin and discreet as trouser socks. ✔ GOOD QUALITY AND LASTING MATERIAL: This Product last for a long duration of time. We see that we provide you with the best win-win price without compromising on the quality. ✔ SATISFACTION GUARANTEED: We provide quality service to our customers. We check products before shipping and we eliminate broken and faulty products.